We had a go at golf ball painting because my husband fished a bunch of balls out of his golf bag for us and it reminded us of this video on youtube we've seen many times. I just set it up like she did, with paint and spoons for each colour in seperate plastic jars. I only had yellow, white and black though as my paint was quite old and I had to throw the other colours out. I didn't make the home-made flour paint for this as I didn't think it would roll as well, its quite sticky and gooey. The non-toxic paint was easy enough to clean if I didn't let it dry, thankfully the activity was short lived so there wasn't much mess. 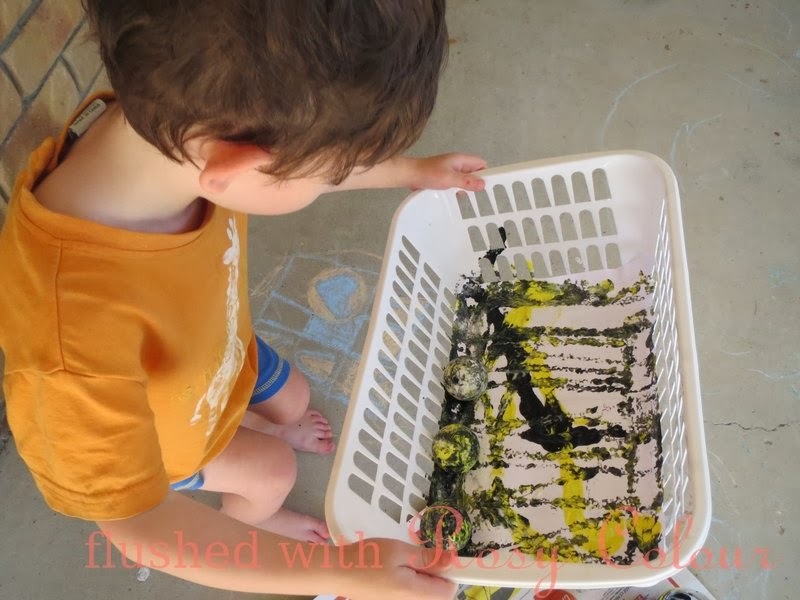 We only did one golf- ball painting, then I let Thomas do some normal painting on paper with a paint brush using the left over yellow, white and black paint. I think I will need to buy some more non-toxic paint in brighter colours in the very near future! Thomas couldn't wait to try the golf-ball painting, knowing what to do as soon as I handed him the basket! Next time, I will have different colours with golf balls ready to go so it will be easier to do a 2nd golf-ball painting in the one session, I'm thinking 6 colours at least!